While no one could rightfully accuse Buffy Summers and the "Scooby Gang" of having a small or unenthusiastic fan base, who’d have expected the canonical comic continuation of Joss Whedon’s vampire-slaying saga to persist for nearly a decade? Season Eight, which launched back in 2007, took the franchise to surprising places—superpowers!—unrestrained by television budgets. 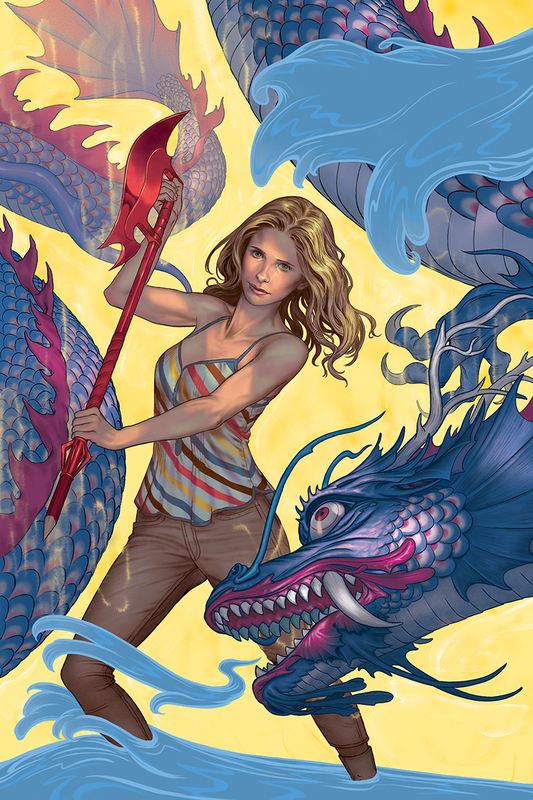 Season Nine and Season 10 continued the trend, with frequent Amazing Spider-Man co-writer Christos N. Gage and DV8: Gods & Monsters artist Rebekah Isaacs transitioning from the Angel & Faith spin-off book to the core Buffy title. Season 11, which kicks off this week, sees Gage and Isaacs back in charge of Buffy, Spike, Willow, Xander and the rest of the beloved Sunnydale crew, now relocated to San Francisco and dealing with an openly magical—and demonic—world. To coincide with the first issue of the new season, Paste chatted with Gage to discuss the massive status quo changes in the years since the show went off the air, collaborating with Isaacs and Buffy’s own political problems to come. Paste: It’s been 13 years since the original television show wrapped, and nearly ten since the comic continuation launched. How influenced do you remain by Sarah Michelle Gellar, Alyson Hannigan and the rest of the cast’s portrayals? Christos Gage: We’re definitely still influenced by the cast’s portrayals. I often pull up an episode just to listen to the voices. Working with Nicky Brendan on season ten was terrific because I was able to insert more “Xander-isms” that I wouldn’t have thought of in a million years. The cast’s work is our inspiration and what we base everything on. I know Rebekah [Isaacs] looks at episodes as well, for reference on everything from body language to fashion choices. Paste: For any lapsed fans looking to jump back in with Season 11, what’s the lowdown on Sunnydale’s finest following the events of Season 10? How much time has passed between the clash with D’Hoffryn and this first issue? Gage: Season 11 takes place a few months after Season 10. All you really need to know to start Season 11 is that the Scoobies are living in San Francisco. Buffy and Spike are giving a real, healthy relationship a try for the first time, and are consulting with the police on supernatural crimes. Giles died and was resurrected in a 13-year-old body with all his memories. Willow is single and basically still Wil. Dawn is in college, and she and Xander are dating. They’re all together, with some semblance of happiness and stability. And, of course, in the first issue of Season 11, we pretty much blow all that up. So you can jump right in. That said, anyone who hasn’t read the comics should really pick up Dark Horse’s lovely and bargain-priced Library Editions of seasons 8 and 9. They’re gorgeous and each contains ten issues of the comics. We also have trade paperbacks out of Season 10, with Library Editions to follow soon, I hope. Paste: Buffy continues to have a sprawling, eclectic cast. Do you have a personal darling, or a character you couldn’t wait to get your hands on? Smarmy preteen Giles might be my new favorite. Gage: He is a lot of fun. I always love writing the side characters who appear from time to time, like Harmony, Clem and Dracula. Especially Harmony. It’s such a blast to write someone who is completely and utterly self-absorbed. And Clem is just so happy all the time, while the portrayal of Dracula that the ever-awesome Drew Goddard (who I had the great pleasure of working for on Season 1 of the Daredevil TV show) set up in Season 8 is an endless well of delight and amusement for me. Gage: That’s true, which is part of the reason we wanted to explore a healthy, happy relationship (at least, an attempt at one). We open with Buffy and Spike in a pretty good place. I know there have been readers who want us to turn up the heat and show more hot Slayer-on-vampire action. I wish I could say we will deliver, but the impact of events in the larger world quickly overwhelm our characters. Does that include their relationship? Wait and see… in the meantime, I am leaving an opening for the fanfic writers to corner the market on the saucy stuff. Have at it! 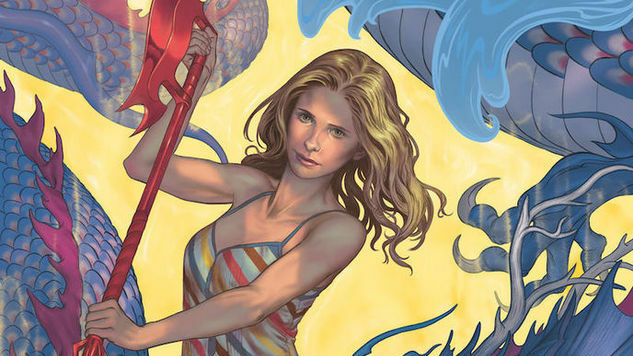 Paste: Recent years have seen the Buffyverse spreading across one-shots, mini-series and sibling title Angel & Faith. How self-contained is Season 11? Can we expect to see the story branching outside of your core title? Gage: Well, there’s the companion Angel series, which tells its own tale. And as a fan of young Giles, you’ll be happy to hear that Joss himself is co-writing a miniseries about him going back to school. I know that sounds like a sitcom premise, and I suspect there will be very funny moments, but I think Joss has some surprises in store for us all. Paste: You’ve now worked with Rebekah Isaacs on a solid chunk of Buffy’s post-show lore. What’s your collaboration like at this point? Already in the first issue, the two of you are pushing the scope of action way beyond what you could ever show on a TV budget. Gage: For me, the collaboration is great. There’s an easy confidence that comes with working with collaborators like Dan Slott and Mike Perkins. I’m sure Rebekah is ready to strangle me because I’m so confident in her awesomeness, especially at getting across a character’s emotions and designing creatures, that I don’t hesitate to dump directions on her like, “Spike says X, but we need to see that he feels Y” or “six demons approach. Design them how you want.” It really should be illegal to do that to an artist, don’t you think? And yet I do, and she handles it brilliantly. We’re excited to push scope and scale of the series. After getting back to focusing on the characters more in Season 10, Joss wanted to raise the stakes this time, not to the cosmic Season 8 level, but bigger than we had. So we’re trying to take full advantage of the comics medium to do just that. Paste: Mild spoiler territory, but it looks like Buffy might be getting political in the near future. What inspired you to bring the government into Buffy’s life, and has the current political climate affected your take on that aspect of the story? Gage: I’m sure a lot of people will read it and think we’re getting political. And to a degree it has; Joss and I are of a similar political bent. We work really far ahead (I had six issues written before Election Day, and the season’s storyline sketched out months ago). So it’s unwise to try and tie the story too directly to current events because things change so fast and then you’re irrelevant. We did talk a lot in the Season 11 summit about the general feeling of impending doom that seems to be permeating our world: environmental crisis, political and ethnic divisions, war, the refugee crisis, etc. Joss feels it especially keenly as a father and wanted to explore some of these things. There was also a feeling that the supernatural, now that the Buffyverse at large knows about its existence, had become too mainstream and commonplace, so we’re taking a sharp turn. I guess people should read it and judge for themselves.